Sony has finally released its TV advertisement featuring Miami residents playing in the foam with photographers using Alpha, Handycam and Cyber-shot cameras. Instead of “Color Like No Other” as in the Sony Bravia series, this ad begins a series with the tagline, “Images Like No Other”, all online at www.sony.co.uk/images. The foam itself was completely safe, approved by MAFF and FDA certified, coming in three different densities for different uses during the shoot. 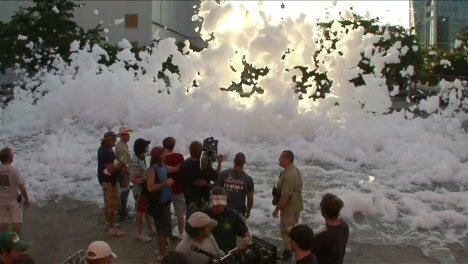 After filming the foam was broken down quickly using a special spray used in catering to ensure minimal impact on the environment. Street cleaning machines were used to remove bubble residue each day. The Foam City campaign was developed at Fallon, London, by creative director Richard Flintham, creatives Samuel Akesson and Tomas Mankovsky, and agency producer Emma Gooding. Filming was shot by director Simon Ratigan via HLA, London, known for his direction of Vodafone Raining Time, Free Range Anchor Buttercups. Editorial work was done at The Quarry, London, by Bruce Townend. Visual effects were developed at Moving Pictures Company, London. Audio post production was done at Wave Studios, London. Organising the shoot in Miami required lengthy negotiations with city authorities, police, the Film Commission and local businesses who needed to close down during production. The foam was made by Back Stage Technologies, using a custom made machine 2.8 meters in diameter. The machine used 1,000 liters of water to create 2,000,000 liters of foam per minute, enough to fill streets 3 meters high and hundreds of meters long in just a few minutes. The machine can fill up an Olympic swimming pool in only 24 seconds. It was estimated that 460 million liters of foam were made by the end of this production. Nick Spells, technical director at Back Stage Technologies, hosts videos from the shoot on his YouTube channel. Piano music was written by Warren Ellis, an Australian composer and musician known for his collaboration in The Dirty Three, Nick Cave and the Bad Seeds, and currently Grinderman. Music was licensed by Leland Music.